The examination is the most important--and most frequent--service we provide. Each of our four clean rooms has a bench which you can rest on while you observe the examination of your pet. 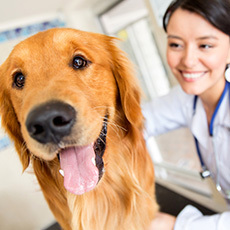 Your pet is reassured by your presence, and you are reassured by the work and words of our doctors. Our clinic is equipped with hydraulic lift exam tables and digital scales to help assure your "Little One" can be fully examined without incident. An accurate weight lets us monitor your pet's health over time as well. The exam rooms, along with the entire clinic, are equipped with a ventilation system that brings in fresh air supply every minute. This keeps the clinic virtually odor free, allowing you to feel more comfortable during your visit.